Get swept away with star style! It’s not that unusual for stars to wear their hair swept to one side, but they don’t always achieve as much variety as they did at the MTV Movie Awards 2012. Lucy Hale looks too sweet to play a role on Pretty Little Liars. She oozes innocence wearing her hair in loose waves swept over the shoulder. In this case, Lucy’s hair is really blowing in the wind, but you can get the wind-blown effect using the strongest-hold hair spray you can find. Lift and shape hair with your fingers while spritzing. Nikki Reed, best known for the Twilight movies, probably inherited good style genes from her hairdresser-beautician mom Cheryl. She knows a good hairstyle when she sees one, and she’s not afraid to try new things. For the MTV Awards, the actress/screenwriter/model wore a one-of-a-kind look that’s a new twist on retro glamour. It’s based on waves created either with finger-shaping, gel and clips or a waving iron. After the “set,” hair is secured in back with the other side left loose to hug the cheek. Obviously, impeccable makeup is required for the finishing touch. At star-studded events, Kate Beckinsale barely resembles her character Selene from the Underworld, and we know she won’t be dressed up like this in the Total Recall movie due out in August. We’re not going to lie to you and say this ‘do is easy to copy. Not everyone has hair this long, thick and able to hold for 30 minutes (much less all night). Even if you meet these requirements, we would suggest getting hair styled in a salon the first time. If you’re good with your hair and really want to try it at home, concentrate on building volume with a blow-drier, volumizing product and jumbo-sized round brush. Then set hair on big rollers or using a waving iron. Another option is securing hair before curling it. What was stylist.com thinking when it placed Louise Roe on the 17 worst-dressed stars at the MTV Movie Awards? Maybe we’re biased because we judge Red Carpet-looks mainly on the hairstyle. And even though her gown wasn’t the best, it wasn’t the worst either. We’re not going to waste room showing Louise’s head-to-toe fashion. More important are that her sidesweep is the curliest shown here. Defined ringlets are enhanced with subtle ombré coloring that gets gradually lighter through bottom half of her mane. The second photo reveals how pretty hair looks flowing over a bare shoulder. While Kristen Stewart‘s hair isn’t the prettiest shown here, we HAD to include it because she often wears her hair swept to one side. Long layers start around the shoulders, and they are blended so well that they would be nearly invisible if they were styled smooth and straight. Unless your hair is incredibly curly, wavy or will hold a curl, you will need to allow a lot of time and product to do the Twilight look. It would help to practice ahead of time until you can get the thick, lifted mix of loose curls and waves. Will the real Emma Stone please stand up? her hair color changes from month to month or week to week! As we hinted at above, Emma’s hair colors are more likely to be copied, as opposed to the other makeover queens. Obviously bleached blond isn’t for everyone, AND the majority of real women would choose an Em shade that’s fairly close to their natural hair color (one to two shades lighter or darker). Single-process, semi-permanent treatments are easier to maintain and change than high- and lowlights. Here, two updos feel different…the first exudes classic elegance, the second girlish charm! Curls are the base of both styles; the first ends up as a messy bun, and the second a messy topknot. Both looks were designed to be “fun,” according to Em’s stylist Mara Roszak. We think she achieved that, don’t you? go straight to celebrity HairStyles: bangs or no bangs. thick or fine. light or dark. it’s all good. Whether famous or not, most women don’t like to be caught wearing the same thing in the same place. But that’s not an issue when it comes to hair. We doubt anyone at Sunday’s MTV Movie Awards noticed that Julianne Hough and Jessica were both wearing long, straight hair. When they’re side by side, you can see the resemblance. Julianne’s mane is blunt cut with a distinct center part and single-process white blond. Meanwhile Jessica opts for ruler-straight bangs, angled fringe, subtle center part, and brown with a touch of ombré. Will KStew and RPatz nab “Best Kiss” for the fourth year in a row? 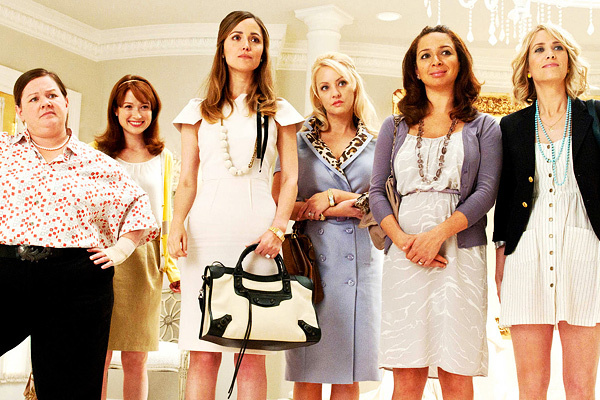 Are you more interested in rom-coms like “Bridesmaids”? No matter what…you’re sure to find a hot n ew ‘do (or 20) on the Red Carpet or during awards show starting in a couple of hours! 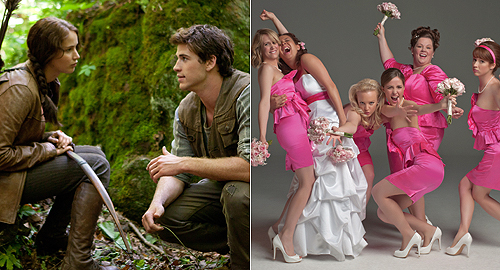 Channing Tatum and Rachel McAdams’ kiss in “The Vow” snagged a nomination. Notice how “real” Rachel’s hair is when she and Channing get frisky. You can see why the messy updo has become a timeless style.